2011? How can it be a new year already? Lots of changes in the air, but for today it’s just a day for relaxing and staying out of the rain. I could do a recap of the best eats or the big changes (boy, were there some changes–thank you for everyone who’s stuck through them with me, you made my year wonderful! ), but for now I’d rather just post the delicious meal I had last night at Lucky. Lucky held their first multi-course meal last night to ring in the new year and, overall, it went off wonderfully. There were a few issues with timing–we were given our fifth and six courses at the same time which meant our sixth courses were a little overcooked from sitting there–but even that hiccup couldn’t detract from the fun, festive setting and delicious meal. I especially stand amazed at the fact that it was only $60 per person, including a wine pairing with 6 out of 7 courses. Holy cheap! I don’t know how they did it! So cheers to the guys at Lucky for hosting one of the best New Years Eves I’ve had in a long long long time. First course was a plate of oysters done three different ways. Bottom right is a raw oyster w/ lime juice (I believe–not sure, didn’t check with the guys on how it was done); bottom left is a roasted oyster in a sauvignon cream sauce; top is a fried oyster with a dijon mustard sauce. The roasted oyster shone the most for me, with its tender, smokey roasting and sweet, tangy, creamy sauce. Pairing wine with cream in the sauce is something I wouldn’t have thought of–I do love a good surprise. 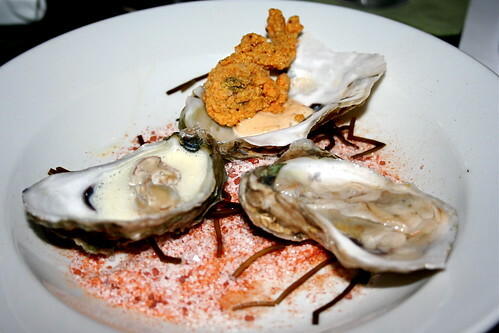 The raw and fried ones were good, though I’m never very impressed with fried oysters. The batter tends to overpower the actual oyster, though this one was light enough that I could still taste some of the sea in it. As for raw–definitely done well. One or two pieces of grit took away from the experience, but the acid balanced it out nicely. Second course was a beautiful little salad of lamb’s lettuce, black eyed peas, pancetta vinaigrette, and goat cheese. 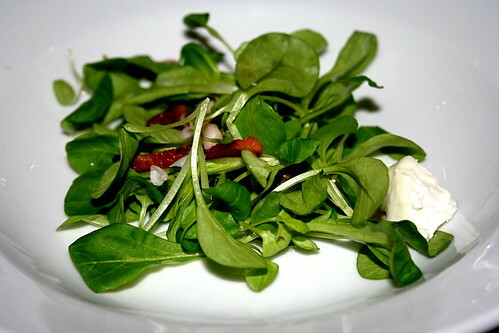 I’ve always loved the delicate quality of lamb’s lettuce, and its nuttiness paired nicely with the bittersweet peas and tangy goat cheese. I’d quibble with the pancetta–it definitely seemed more like bacon than pancetta to me, but I could stand corrected. Bacon or pancetta, the smoky salty vinaigrette was delicious. Next up was a piece of seared foie gras in a champagne syrup. Now, before I get any comments on the ethics of foie gras, read this lovely article on the physiology of foie gras by the folks at Serious Eats or watch Dan Barber’s TED Talk on the subject. Granted, the duck or goose dies in the end, so to some, it’s unethical no matter what, but I think it’s an interesting subject to think about, especially given the way we’ve turned it into such a debate in the U.S. Now, to the foie gras at hand, I must say, yum! Jeff, the chef at Lucky, explained a few of the wacky elements to it, but I think he saved what could have been a culinary disaster. The sweet champagne syrup was a lovely accoutrement (though I would have given a shave or two of black truffle on top, personally, to bring out some earthy notes), and the foie gras was buttery and divine. I could have eaten a plate or two more of it for sure. 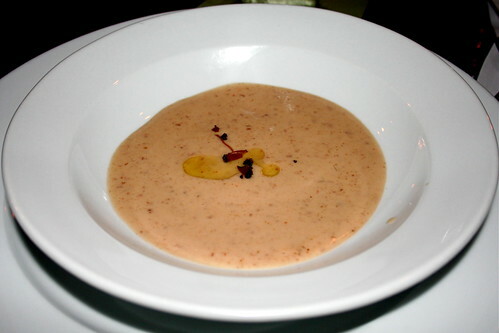 Fourth was a chestnut black truffle soup of divineness. I wanted more. Much more. But, for what we were served, delish, delish, delish. Creamy roasted chestnuts with a shave or two of black truffles and some black truffle oil, I think the dish was one of my favorites of the night. There’s something to be said about simplicity and that’s what shone for me. It was an unpretentious course, but a well thought out one. Any chance of it staying on the menu, Jeff? The fifth course, I have to admit, seemed like a throw-away. 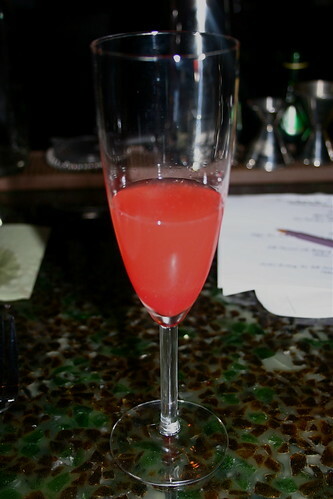 Yes, a palate cleanser, but not really a course… but hey, it was tasty to drink! A blood orange granita with some Virginia sparkling wine, I think, but I can’t remember and I apparently left the menu at the restaurant last night. Sigh. It was refreshing, tart, and fizzy, so that’s a good thing. But not really a course. You win some, you lose some, I suppose. Ah, the stars of the night–the sixth course dishes. We were offered a choice between the pheasant and the steak, so, of course, G & I ordered one of each to share. First, the pheasant. 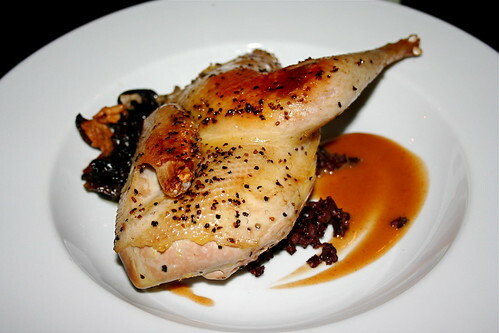 I really really really wanted the pheasant to be delicious, but, unfortunately, it was overcooked and dried out. Most of that stems from the fact that they were cooked in halves, and not whole, but it is also a result of being given the course too early, when we’d just been given the granita. So we weren’t ready to eat it, so as it sat on the plate it probably continued to cook. The black rice with fig reduction was incredible though, and absolutely stellar with the wild mushrooms. And when I took a bite of the pheasant with the rice, figs, and mushrooms, I could see how well the dish could taste if it had been executed properly. Again, you win some, you lose some. A well balanced dish with some exciting components that just didn’t work out 100% in the end. The steak, on the other hand, was incredible. Jeff said he gets his steaks from a man in Lynchburg who has a buddy out west who raises Wagu cattle out West. It’s primo stuff. Nicely marbled with a beautiful line of fat on the left side, the steak was seasoned and cooked wonderfully. Again, it continued to cook a bit more while it sat on the plate before we ate it, but since it was supposed to be medium rare, the steak was medium, and still delicious. The souffled potatoes were very simply and perfectly done, and with the combo of wild mushrooms, steak, and potatoes, the plate was great. 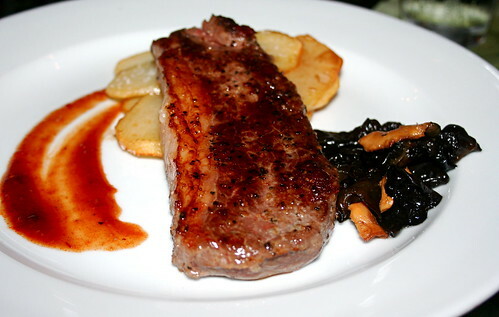 I’m not a huge steak fan, but this dish might have turned me. I’m going to have to go back sometime and get one from the regular dinner menu sometime. Last, but not least, the dessert course. I was so so so pleased to see a plated dessert, especially after the not-so-stellar apple and goat cheese tart I had the last time I was there. 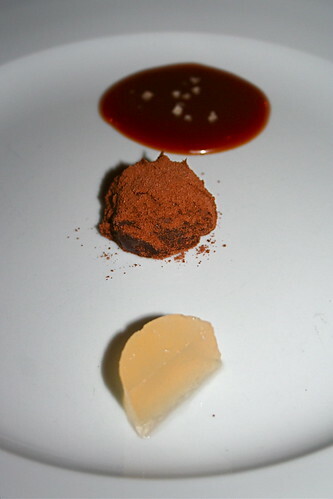 It wasn’t super crazy or adventurous, but it was good: bacon truffle with champagne gelee and salted caramel. It was good, and I especially loved the truffle with the caramel, but I definitely didn’t taste any bacon. Not that it detracted, just that I think the bacon would have been interesting. I would love to see more plated experimentation in the dessert department at Lucky and I think this is a step in the right direction. Rock on. So there you go: a New Year’s feast! I’m ready to bring on 2011 and all the good eats that I’m sure are to come. I can’t wait to see Lucky expand and get more comfortable with its routine, and I would love love love to see more multi-course events go down. As a restaurant, it has so much potential, and I think 2011 will really bring out the best in it. 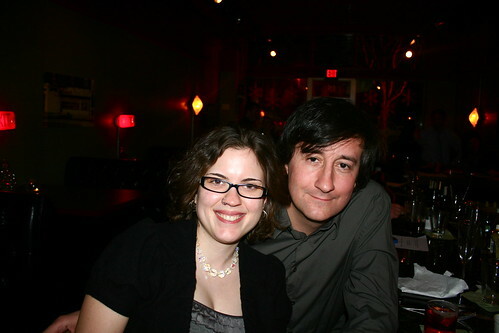 So from G & me to all of you, happy new year! for something actually grounded in science. No matter how “humanely” the birds are kept and handled, foie gras production involves feeding an animal until their liver is pathologically enlarged. 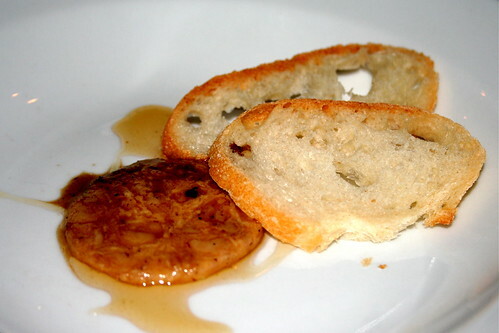 Foie gras production does take advantage of these birds natural tendency to store fat in the liver, but it exaggerates this to pathologic levels. If the force feeding continues past a few weeks, these animals will die from the resulting steatosis. I guess this all centers around what you consider humane. I do believe that animals can be raised humanely for food production, but force feeding an animal to a disease state doesn’t seem okay to me. Thanks for the EU PDF–I’m looking forward to reading it! I’m not sure exactly where I lie on the ethics, I’ll admit it, but I think it’s a discussion that needs to be held in all restaurant realms. For a chef who needs to serve meat at my restaurant, I think about it a lot. Being trained in ecology as an undergrad, I’m super interested in scientific and policy papers. Also, I meant to email you back a long time ago, and hopefully I’ll find the time to do that soon. I really really really appreciate your well thought out comments, they mean a lot to me! Happy New Year to you, too, Jes! You look so pretty and elegant in the picture—you and G make a lovely couple.